Good evening, my friends. Please allow me to introduce you to a very warm-hearted adventure full of death, intrigue, suspense, and death. Oh! Did I say 'death' twice? Well, I am slightly impartial to death, and so will you, when you watch the following 75 minute movie made in 1959. It was Directed by: William Castle; and Starred: Vincent Price, Carol Ohmart, Richard Long, with Alan Marshal. All the doors are locked. The house is haunted. And I am your host, Frederick Loren, (Vincent Price), and along with my beautiful lady wife, Annabelle (Carol Ohmart), I'd like to offer you one simple proposition. Stay here for an entire night and I will personally give you ten thousand dollars. So go ahead Lance, David, Nora, Watson, and Ruth (Richard Long, Alan Marshal, Carolyn Craig, Elisha Cook and Ruth Bridgers), take one of those guns sitting there on the table and defend yourselves however you so wish. For instance, if a clawed fist should strike at you from behind, shoot it down. If a decapitated head looms in the distance, scream at it accordingly. And if you spot a ghoulish apparition flying from the rafters, well, just do whatever you want. But please remember, you must stay alive long enough to collect your reward tomorrow morning. Then again, that's most probably why what next transpires really gets this party started when I have to cut down my misses from the ceiling. As a pretty young thing is scared out of her wits - a couple of gents start falling to bits - a plan is hatched to kill the host - and at the end of the day, to the victor, a toast! 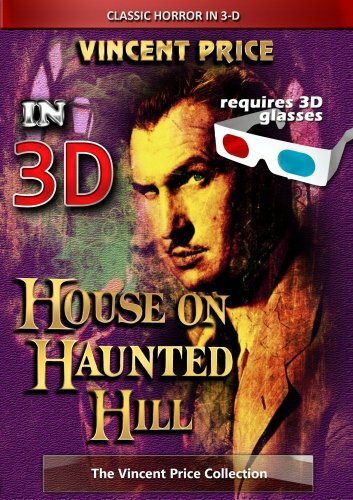 If you enjoy watching timely and suspenseful tales involving a group of strangers trapped inside a haunted house, then my God, 'House on Haunted Hill' is defiantly a film for you. Essentially it's one of those black and white films which present's itself in a very simple fashion. To begin with its noir-like yet pithy introductory sequence laid down the basic framework for it's straightforward pretext to play off of -- a nutty millionaire offers a cash sum to a number of people to stay in a haunted house for an entire night. Then it introduces the cast of characters directly involved with the plot -- giving each of them a reasonably a-typical tick or nuance so they can make themselves known. And last but not least the plot allows for most of them to interact with each other until the final pay off was ultimately revealed -- and trust me, folks, what a pay off it truly was. Well! What can I say? I am biased! 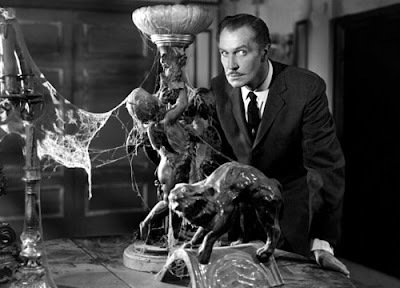 As I love watching these type's of tales as well as being a big Vincent Price fan! Without a shadow of a doubt he defiantly knows how to play suspenseful, sinister, and charming, without making himself appear too hooky as well. Honestly, dear reader. In my eyes Vincent just has that amazing ability to switch gears without making you switch off to his performance. Also, as I implied previously, I appreciated how this tale had a very simple way of creeping up on you the more it played out on screen. Never once did I wonder what the hell was going on or why a certain character did x, y, or z. Although on many an occasion I did yelp at the monitor 'Oh, no! ', 'Run away', or 'Get the f*ck out of there' because it's telling was so engrossing for yours truly. On the flip side of things though, I wasn't overly happy with a couple of the special-effects deployed throughout this flick -- most notably the skeleton seen at the end of it. Plus in my opinion I would have preferred if some of the male characters -- excluding Vincent Price, of course -- were different in statue and poise because at least two of them seemed the same. Anyway. Apart from those slight gripes, all in all this was one hell of a cracking film to watch. And what now follows are some really cracking filmic-facts!!! 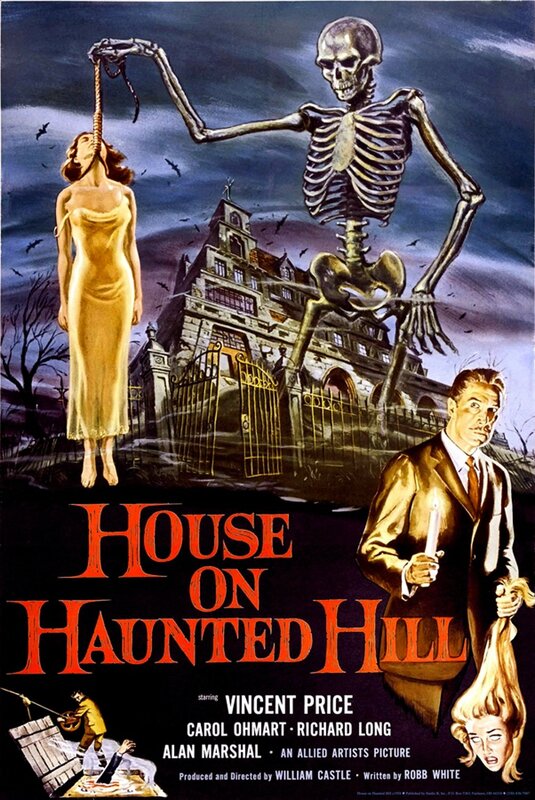 (1) 'William Castle Productions' first screened this $200 thousand dollar horror classic in Austria on the 17th of February, 1959, and eventually clawed back $1.5 million dollars at the box office. (2) Loosely translated, this project was entitled 'Sinister Mansion' in Argentina; 'Night in a Haunted House' in Finland; and 'Scream at Midnight' in Sweden. (3) This tale was limply based on two novels published in the twentieth century. The first one was Agatha Christie's 1938 opus, 'And Then There Were None'. Whereas the second one was Shirley Jackson's 1959 book of the same name. (4) The majority on this movie was shot in and around Ennis-Brown House, 2655 Glendower Avenue, Los Feliz, located within the Californian state of Los Angeles. (5) One of the taglines used to promote this picture, was, 'The 13 greatest shocks of all time!'. (6) Because this thriller did really good business at the box office, it actually inspired Alfred Hitchcock to create his 1960 classic, 'Psycho'. (7) In 1999 William Malone remade this film for a more modern day audience, starring Geoffrey Rush and Famke Janssen. Whilst in 2007 Víctor García made a sequel entitled, 'Return to House on Haunted Hill'. Regrettably, though, both the remake and the sequel received negative reviews upon release. (8) After this flick went bump in the night, Vincent Price starred in the sci-fi adventure, 'Return of the Fly'; Carol Ohmart starred in the TV Series, 'Bronco'; and Richard Long starred in another TV series, 'Sugarfoot'. 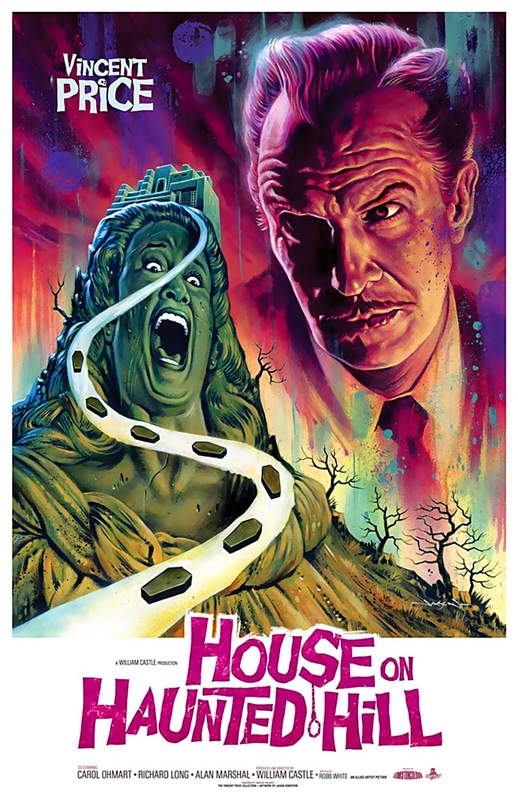 Overall I'd say 'House On Haunted Hill' is a must see film for anyone who loves suspenseful tales involving Vincent Price, a groups of trapped characters, and a fairly well presented haunted house. Yeah! It's simple as that, really. Nuff said.